After EJ left for work today, I took Danny for his walk. The sky was mostly cloudy, but the weather was warm–almost 60 degrees! When I turned onto our street, I saw a large dog loose about halfway down the block so I turned around and went an additional block to avoid him. I didn’t want to risk us getting into a hostile dog situation. You never can predict how two strange dogs will react. Although there are still leaves on some of our neighbors’ trees, most of the leaves are off the trees in our yard so, since it was a warm afternoon, I decided I’d mow the lawn one last time. Mostly I wanted to mow the leaves. Mowing is easier than raking and bagging. I had to walk to the gas station to get more gas because EJ had to use the mower gas for the car the other day because someone has been stealing the gas from our car. EJ has been only putting in a little gas in the car so thieves can’t get a lot and he’s been parking the car along our stone wall to make it more difficult for them, but our gas is still getting stolen. I hate thieves!!! Anyway, all my mower gas was gone so I had to walk down to the gas station to get more. I didn’t want to bring the gas can into the store with me while I paid for it and I didn’t want to leave it outside where someone could walk off with it, so JJ went with me and stood guard while I want in to pay for it. The spiders in the card my friend sent me. When we got home, JJ told me that I had something in my hair–it was a leaf…no, it was a bug. I said, “Get it off! Get it off!” but he took his own sweet time, telling me that he was having trouble getting it out of my hair. He pulled me into the bathroom so I could see it in my hair, but I didn’t want to see it. Since JJ wasn’t quick enough, I grabbed my brush to brush it out of my hair. 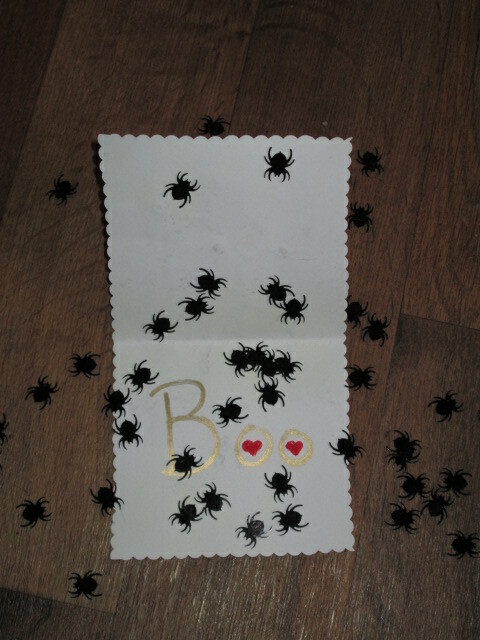 What fell out was one of the spider confetti that my friend had put in the card she sent me earlier this week. I gave JJ THE LOOK and said, “Seriously? Seriously, JJ?” He laughed. I told him, just wait, I’ll get my revenge sooner or later. I went outside, filled the mower with the gas, and got to mowing the yard. The leaves were so thick that the mower was like a snow plow pushing a growing pile ahead of it. Plus, the mower kept getting stuck in mole holes. It was hard work and I thought that I’d never have the energy to mow the whole lawn. So I stop and raised the mower so it wasn’t so low to the ground. After that it went easier and I was able to mow the leaves into little bits. I mowed every part of the yard except where the birdfeeders are because there is not much grass there and the leaves will blanket the plants there. After I finished, I put the mower in the garage for the winter. I’m sure more leaves will fall and get blown into our yard, but it’s enough that I got these leaves mowed. The initial effort with the mower fatigued me so much that when I finished mowing, I came inside and collapsed on the couch for a while. Then I did a few small chores and made popcorn. I am now snuggled on the couch writing and surfing the Internet while I snack on my popcorn. But I will be plotting my spidery revenge on my dear, sweet son. JJ really knew how to hit you with the spider confetti. He deserves a really good revenge from you…..Just keep on thinking….